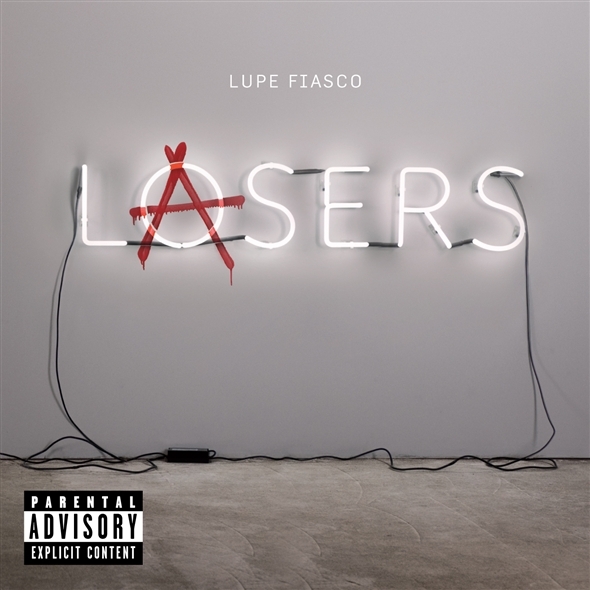 Lupe Fiasco’s Lasers drops on March 8, 2011. Seems like a long time since his tweets in the summer saying his album was done huh? Well at least he has a release date and is not in the stalemate with his record company that he describes here. Here’s the cover art. Anyone else excited? Now I’m on a Lupe Fiasco YouTube marathon. I’m still in awe that “Dumb It Down” made it to radio with its sophisticated, extended metaphors and far out references. I still get inspired by this song. The metaphors are crazy! For instance, I like Fab, but he’d say something like “since yay tall, I’ve been like Ray Charles/ I don’t see nobody”; dope and straight forward, but also lends explanation to the lyrics which can come off cheesy. But Lupe will say “I’m earless, and I’m peerless, that means I’m eyeless”; he says he’s without hearing or sight, meaning he can’t hear or see his competition, but also he means “peerless” as in without peers, meaning no one is lyrically on his level, whoa. This is followed up by multiple references made back to these statements in this verse and throughout the extent of the song, creating a complicated lyrical web of various themes and topics intersecting at multiple nodes. This entry was posted on January 20, 2011. It was filed under Art, Music and was tagged with business, hip hop, Lupe Fiasco, Music Industry.